San Marcos won 21-20, and in the years since then, the crosstown football rivalry has been basically even. The Royals presently enjoy the upper hand after beating the Dons 35-13 last Friday night in the 50th Big Game. Santa Barbara, which had won the first five games, leads the overall series, 27-23. The latest tussle at the San Marcos field was spirited and hard fought. The loss doomed the Dons to the second winless season (0-10) in their proud history. The Royals eked out a 3-7 record, including a victory over Dos Pueblos, and that was the best any local team could do. It was a great night for San Marcos running back Cody Clark (167 yards rushing and two touchdowns). Graduates of both schools come back every year to see Green and Gold clash with the Royal Blue and Crimson. Many of them have spouses and kids who went to the “other” school. Many have become friends with players they once lined up against. Marcos Arredondo, a wide receiver on last year’s San Marcos team, was missing from the alumni section Friday. He was killed in a head-on collision with a wrong-way driver a week earlier. He was buried earlier in the day-another piece of the bittersweet lore of the Big Game. BIG SOCCER DANCE: UCSB goes into the NCAA men’s soccer tournament for the eighth consecutive year today (Thu., Nov. 19), hosting a first-round match against the Wofford College (South Carolina) Terriers at 7 p.m. If the Gauchos win, they’ll have to hit the road in the second round Sunday at the University of San Diego. Their failure to secure a favorable seeding-after a dismal 4-1 loss to UC Irvine in the Big West tournament last weekend-will make it hard for the Gauchos to reach this year’s College Cup in Cary, North Carolina. But they did it in 2006, when they won the national championship in St. Louis. Next year, the NCAA tournament will wind up at UCSB’s Meredith Field/Harder Stadium, the site of the 2010 College Cup. COLLEGE HOOPS: The first weekend of the basketball season had local college teams coping with pain and showing promise. UCSB’s women took the floor against Fresno State with two regulars, Margaret Johnson and Christine Spencer, sidelined by injuries. Mekia Valentine, their outstanding 6’4″ center, needed 14 stitches to sew up a laceration that resulted from snagging her finger on another player’s shirt in practice. Despite a cumbersome bandage on her right hand, Valentine had a double-double (22 points, 10 rebounds) in UCSB’s 84-76 defeat. She scored 14 points and blocked seven shots Monday at Nevada, but the Gauchos were ice-cold on the perimeter in a 59-43 loss. They play their next two games at the Thunderdome: Sunday at 2 p.m. against Loyola Marymount and next Wednesday (Nov. 25) against Kentucky at noon. 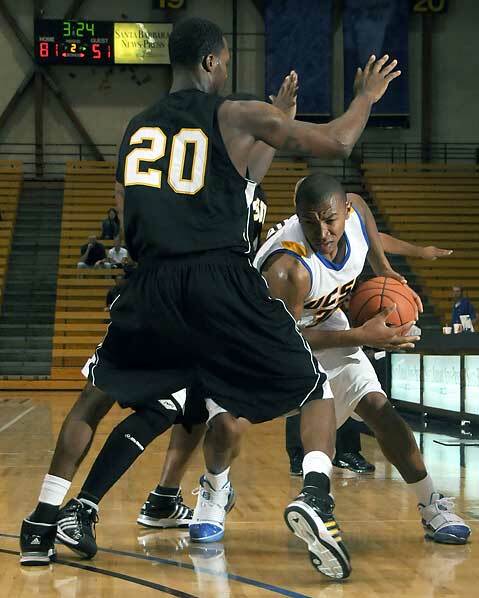 UCSB's Orlando Johnson (holding ball) scored big against Cal State Los Angeles in the Gaucho's November 14 victory. UCSB’s men have lots of depth, and they showed it by wearing down Cal State Los Angeles 85-57 in their opener. Orlando Johnson (19 points) led four Gauchos in double figures. They will host San Francisco on Monday (7 p.m.). UCSB is offering affordable season-ticket packages ($125 for men’s basketball and $100 for women’s). The excitement level at Westmont College is high after the Warriors scored a 90-74 victory over the NAIA’s top-ranked men’s team, Robert Morris of Illinois, at the Las Vegas Shootout. Forward Dan Rasp (29 points) and guard Andrew Schmalbach (21) led the way. Westmont’s home opener is Saturday (7 p.m.) against Cal Poly Pomona. At 7:30 p.m. Friday, Westmont’s women will take a 3-0 record into their first home game against Occidental College. SBCC’s women won two out of three games in their own MTXE Tournament-acronymed after the team’s slogan: “Mental Toughness, Extra Effort”-and will host Mt. San Antonio College at 5 p.m. Saturday. RALLY AND RUN: There will be a rally in support of UCSB’s Department of Exercise & Sports Studies-a target of UC’s budgetary ax-from noon to 2 p.m. on Friday (Nov. 20) at the Student Recreation Center. Runners and walkers will gather at the Faculty Club lawn Saturday morning for the 32nd annual Turkey Trot. The 10-K run starts at 9:30 a.m., followed by a 5-K run/walk.